For the St. Paul project, Yeadon selected Seaman's Shelter-Rite® 8028 high tensile, flame resistant PVC coated polyester fabric because of its excellent strength. St. Paul, Minnesota, baseball teams can take to the field year-round in a massive air-supported structure constructed with Shelter-Rite architectural fabric by Seaman Corporation. The huge, round structure is 90 feet high and 360 feet in diameter, without any interior supports to obstruct play on the protected practice field. It is used by a variety of teams; both baseball and softball, thanks to an infield with adjustable baselines. 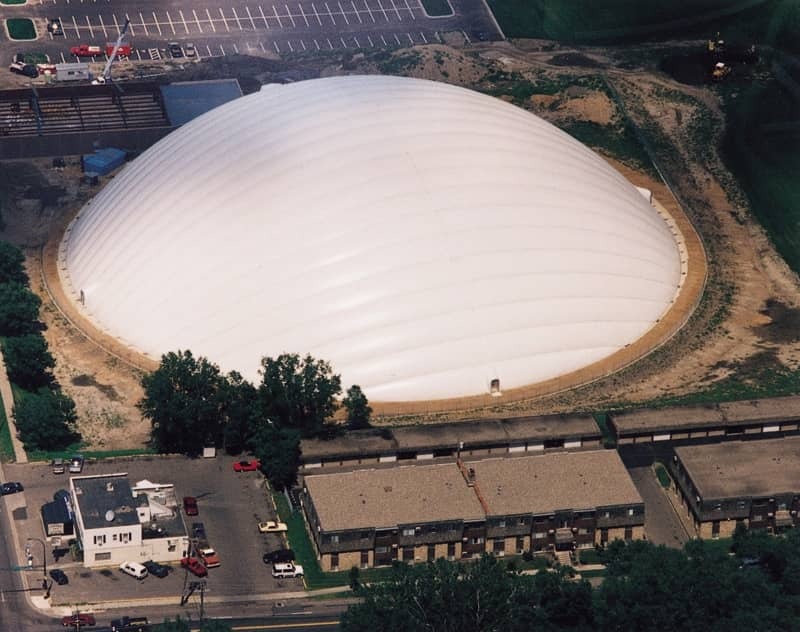 Owned by the St. Paul Parks and Recreation Department, the Rice & Arlington Sports Dome was fabricated by Yeadon Fabric Domes, Inc. Over the years, Yeadon has earned a reputation for its low-cost, clear span practice structures, created for a variety of college and pro teams, including the Chicago Bears, New England Patriots, Pittsburgh Steelers, Detroit Lions and Boston College. For the St. Paul project, Yeadon selected Seaman's Shelter-Rite 8028 high tensile, flame resistant PVC coated polyester fabric because of its excellent strength. A translucent Shelter-Rite architectural fabric is available to take advantage of ambient light, or customers can choose a light-blocking opaque material. There's also a choice of top finishes - standard or Kynar with added strength and self-cleaning properties to repel snow, rain, dirt and grime. Shelter-Rite fabric also complements Yeadon's reputation for excellent R-value energy efficiency, incorporating innovations in mechanical, electrical and other operational systems.